Sadly, the weather had the last laugh on this occasion. The rains came at 11 o'clock after only three displays had been flown. Persistent showers and strong winds eventually led to the cancellation of the rest of the event. Besides taking the difficult flying conditions for the pilots into account, the Safety Director had to consider the rescue teams on standby as well. They would have had a difficult time to help a pilot in trouble, had there been a need to call on their services. The 2009 Margate Airshow was the first air show in South Africa to be staged off-shore and took place at Margate's Main Beach on Kwazulu-Natal's South Coast. The planes flew their routines over the sea and the beachfront served as the viewing area for spectators. Proceedings kicked off with a parachute drop from a Piaggio Albatross. This was followed by a solo display of the Albatross. 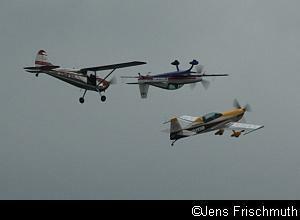 Next, a Cessna 170 flew in formation with the two Extra 300s of Brad Bennetts and Ian Billing. While the Cessna flew in a straight line, the two aerobatic aircraft flew circles around the Cessna and flew upside down in the formation for a while. The three planes only flew a single pass along the crowd line, their display probably cut short because of the strong wind. One could see the planes being thrown around quite a bit. The final display was flown by the Gabriel Wings Team, made up of the four Pitts Specials of Scully and Ellis Levin, Arnie Meneghelli and Stew Lithgow. 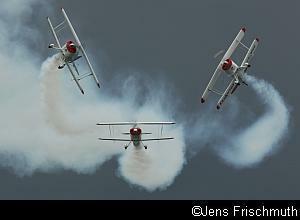 Although they flew their full routine, again it was visible that the wind was making life difficult for the pilots. The white smoke against the dark clouds looked spectacular. Lets hope the weather plays along for next year's Margate Airshow.